Equality of mankind is achieved by recognition of its similarities and its differences. For only then is balance recognized, and greatness achieved. Does this path have a heart? If it does, the path is good. If it doesn’t, it is of no use. Our existence is tied to the interconnectedness that holds us and everything else together. There can be no one place to be. There can be no one way to be, no one way to practice, no one way to learn, no one way to love, no one way to grow or heal, no one way to live; no one way to feel, no one thing to know or be known. The particulars count. One gains an authentic sense of pride only from one’s own achievements, not from inherited characteristics. Out of chaos came order, and out of diversity came unity. The real world is diverse…significant diversity that exists in the ‘real world’ is intellectual diversity—the diversity of ideas. Deriving one’s identity from one’s race is a corruption—a corruption not appropriate to living in space or to a nation based on freedom and independence. Diversity teaches to look beyond the superficialities of human differences, and to measure what really matters, namely, the ‘content of human character, not its color.’ Only then will the nation and other nations as well prosper; only then, will they be strong; and only then will their science and human conditions find the common ground. Diversity is not a program, but a way of life, a way to achieve excellence among the whole when unachieveable by it parts . . . not only does our science and space missions need it, but our lives depend on it. Diversity may well be the key to our very survival, our very existence in a world where America’s core principles and values are under attack from every direction. Our survival in space, as well as the survival of humanity itself, may depend in the future on how well we orchestrate the resources of our diversity among the Earth’s people, cultures, and their inventiveness. Diversity should rank among NASA’s crowning achievements along side its science, engineering and technology . . . for without it, we have only produced a cold, lonely, insensitive and heartless mechanized world. Science and technology are the children of the human mind which know not color, race or creed—only the mothering nurture of human thought. When history records NASA’s crowning achievements, what will it choose to say? Will it note for future generations how we accomplished the impossible, or will it praise our ability to get along with each other? Which shall be judged the greatest essence of mankind’s glory of achievement? We dared to go to the moon as a challenge to do the impossible—diversity is a much harder mission to accomplish, but we shall succeed, and again be the victors! Diversity allows for the genius differences of the common man to shine as brightly as other stars of ingenuity. If genius were restricted to the color, shape and stature of mankind’s shell, then intelligence would be altered by the number of wrinkles and scars of its experience. The ultimate countenance of diversity is acceptance and inclusion, without which the parts can never be made whole. What good would it benefit mankind if another’s differences were ignored? Can the blossom bloom without the stem? The blossom of the rose is the beauty, but is not the stem, unattractive to the eye of the blossom, of necessary support and value? The common ground between similarities and differences is respect. For diversity means to accept both with respect equally. Diversity means honoring the light within each of us. Diversity that knows no separation between minds, also recognizes no separation between spirits. When diversity becomes the product of the equality of minds, difference turns constraints into cooperation. The greater the complexity of structure, the greater the odds of decay. Science is not the straight and narrow path to truth, but rather, a trail fraught with many nooks, crannies and traverses. After all, what is the purpose of science but to learn from the universe the principles of love and meekness? Could there be no higher purpose of scientists? Science helped to not only usher in the age of knowledge, thought and reason, but assisted in mankind's liberation of fact from superstition; truth from dogman; and logic from dubious beliefs. The goal of science is not the pursuit of greater economic prosperity, but the greater acquisition of truths that lead to greater appreciation of the Supernatural Creator and all of Creation. The marvels of science are the children of science. The natural path of science is to enlightenment of the soul. Science is the tool and ongoing process to break loose the shacles of stupidity and require freedom from the slavery of ignorance. 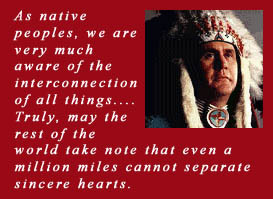 The main distinction of the American Indian scientist and philosophers of other cultures is his or her simultaneous embrace with nature and the Divine Supernatural. Science is a promisng field for philosophical inquiry and insight into the world. The greatest spiritual awareness is the realization of oneness with all Creation. A scientist is a true love of knowledge. The spirit of science is to find answers to the unresolved questions and mysteries of life and our cosmic existence--To map, quantify and change or refine the nature of our human experience. Science is mankind's complementary response to the unknown--born of curiousity, inquisitiveness, speculation, and the desire to separate reality from illusion and fact from fiction. The end results of science are not the end of faith in a Supreme Creator, but an increase in it. A scientist prefers to not engage in blind faith, but to seek reason or evidence for belief. But scientific greatness is a mixture of both. The ultimate business of science is not to answer the question of whether or not there is a Supernatural Creator. The deeper one delves into the grand designs of the universe and explores its mysterious intricasies, the deeper one's faith in the divine. To the native scientist, his or her spirituality and science are inseparable. They are a way of life . . .
Human minds are the fertile grounds where the seeds of ideas, opinions and concepts are being continually planted and harvested. True love nurtures one's spirit . . . The worst realization with the greatest impact to our hearts is when we realize, too late, that love came knocking at our door, but we let it pass by. Love missed is an abominable misfortune like being born blind and never having the opportunity to see the colors of the rainbow or bask in the joyous delight and inspiration of a beautiful sunset. There are two things especially which are a dep seated part of being in love: honor and duty. Love is but another emotional wave sweeping over us among the tides of human desires. True love demands nothing less than one's full commitment. Love waits for no one too long, for it can dwindle to a trickle when once a river of passion, deteriorate to a thread when once a fabric, and suffocate, decay in its own fumes of heartache and loneliness with the lack of the breath of attention. If love comes, and wants to show its face, it should be permitted to be free and not held back dangling like a kite leashed to hand by the emotional strings of fear. The future of humanity is ultimately ruled by its evolution of the mind, and its allied ability to make the right choices towards love and the pursuit of happiness. It is the true genius who can admit at times to being ignorant. Great things emerge from modest beginnings. . .
Greatness without failure is like pushing a wet noodle in a straight line. The seeds of desire, planted in the fertile mind, fertilized by persistence, watered by commitment, nurtured by failure, ripen to success. Success is not measured in the finality of achievement but by the yardstick of preparation. The trouble with trouble is that we spend too much time and energy making it, storing inventories of it, and trying to sell it whenever we can to others who already have houses full of it and garage sales to get rid of it. Ideas are like seeds: they only grow and mature in fertile minds by those who farm the fields of persistence, tenacity and commitment. If we think something inferior, then we do not truly understand it. To not have a plan is an accident courting disaster. Happiness is a state of love in action. The Higher Power of the universe is more vast in dimension and more incomprehensible than any religion proposes. After all, isn't the common foundation of all religions love? If a religion is not, then it is an imposter. J.C. High Eagle grants permission to use his copyright material only for private purposes. For reproduction or use of copyright material beyond such uses, permission must be sought directly from him by writing to: jchigheagle-usa@yahoo.com. If given, permission will be subject to the requirement that the copyright owner's name and interest in the material be acknowledged when the material is reproduced or quoted, in whole or in part.